Some players find themselves inextricably linked as their careers develop. It may be through rivalry, partnership, friendship or circumstance. 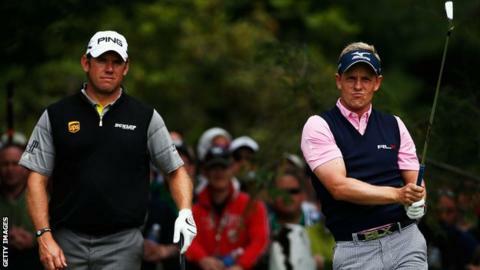 All these scenarios apply in the cases of Lee Westwood and Luke Donald. The two Englishmen know what it is to be the best player on the planet, Ryder Cup partners and to battle the march of time in an as yet elusive quest for major glory. They share practice rounds at Old Palm in Florida and like to banter on Twitter. By coincidence, on opposite sides of the globe, both have just found ways to reignite their golfing years. Westwood romped to victory in the Malaysian Open while Donald came up just short against Matt Kuchar in the Heritage event on the PGA Tour. Each will feel these displays, their best of 2014, are the products of hard graft, remodelling actions that had previously taken them to the world number one spot. When they reached that summit, both celebrated the achievement but neither was satisfied. Heading the rankings is one thing but bagging a major genuinely puts you on top of the world. Growing up and on the practice green you do not hole putts to become number one in the standings; you hole them to win Opens, Masters, US Opens and PGA's. And if your tour play is sufficiently consistent to make you statistically the game's best player, then surely you have the ability to win one of the sport's biggest four titles? Westwood reached number one in November 2010 and the 36-year-old Donald took over by beating his compatriot in a play-off for the BMW PGA Championship at Wentworth the following year. Assuming such a lofty position also brings pressure, especially at major time. There is a burden of expectation that weighs heavy. It can suffocate rather than stoke an already insatiable desire for success. When you go into a major as a world number one, you are noticed. There is no hiding from a build up punctuated by a string of interviews and news conferences. The topic of conversation is always the same and there is no genuine answer until one of the big four championships is won. And as both Westwood and Donald emerge from recent slumps, that overbearing question remains. These two players, who combined to destroy Tiger Woods and Steve Stricker in a vital 2010 Ryder Cup foursomes, are still desperate to put an end to it being asked. Sixteen months ago, Westwood uprooted his family and relocated to Florida. He found a much better short game but under the tutelage of Woods' coach Sean Foley lost his prowess from tee to green. He became Samson after a visit to the barbers. Devoid of his greatest strength, the fact that he could at last chip and putt did not much matter. It has taken Sunday's win to return him to the world's top thirty. By implication, [Westwood] is claiming to be, at last, the complete package. But technical proficiency has to be allied to mental certainty. Now working with Pete Cowen disciple Mike Walker, Westwood has rediscovered power and accuracy from the tee and in his approach play. Cowen used to oversee the Westwood swing and Walker is best qualified to rediscover it. "The difference now is that I also have a short game," Westwood said after his seven-shot victory, the biggest winning margin of his career. By implication he is claiming to be, at last, the complete package. But technical proficiency has to be allied to mental certainty. Westwood, 41 on Thursday, still needs to show that against the best players in the world he has what it takes to make the decisive drive, chip or putt at the key moment on a Sunday. With 16 top-10 finishes in majors, Westwood knows all about being on the leaderboard but nothing about finishing the deal. Having finished seventh at the Masters earlier this month, and now with his 40th career win, at least the odds suggest he can continue to contend. With Donald, currently ranked 18th in the world, there has also been a significant coaching shift. His inability to make the most of a promising 54-hole position at last year's US Open proved the catalyst. In fact, make that a 53-hole position. It was a woeful second shot to the 18th on the Saturday evening at Merion that convinced him of the need for change. Donald concluded he did not have the armoury to make the breakthrough on the toughest courses. He took the tough decision to part with long-time coach Pat Goss and seek a new swing guru. It was a typically hard-headed decision. Remember this is a player who some years ago sacked his caddie brother Christian in his quest to reach a higher level. Donald had hoped Foley would also become his coach but, with the likes of Justin Rose and Hunter Mahan to look after as well as Westwood and Woods, the Canadian teacher said he would not have the necessary time to devote to Donald. Foley recommended Chuck Cook, who had overseen the careers of Payne Stewart and Tom Kite and currently looks after US PGA Champion Jason Dufner. Cook set about giving Donald a more compact swing that is less 'flippy' through the hitting area. More powerful from tee to green, with his renowned short game he would have a platform to make him a world beater. The signs are encouraging but the job is not complete. His biggest concern at the Heritage will be what happened on the final hole. When he needed a birdie to force a play-off, Donald could only fan his four iron into the wind short and right of the green. It was yet another near miss on a strategic course where he has had a string of high finishes. The mistake on the final fairway was just the sort of error he is trying to eradicate. Donald nearly pitched in but he should have been putting. That said, it took an earlier holed bunker shot from Kuchar to deny the Englishman a play-off. It still constitutes an important return to form and a fair degree of validation for his swing changes. There is genuine cause for optimism. And Donald and Westwood earned much needed Ryder Cup points. Captain Paul McGinley will be keen to have both players in his Gleneagles team, given Donald has won all four Ryder Cups he has played while Westwood has only been on the losing side twice in nine matches. They could prove the heartbeat of the team in September. More immediately, there are huge events coming up. The Players Championship and PGA at Wentworth are tournaments they have played well in the past. Then comes the US Open at Pinehurst, which shapes up well for both of them. They will be looking to build on last week's successes with rising confidence. Whether they carry too much major scar tissue for them to succeed in their ultimate goal remains to be seen. It is that stubborn, nagging question. But no one can deny that they are doing everything they can to shake it off. They most definitely have that in common.